Big flimsy planks are harder to make that I thought. When one constructs a thing like this in one's head the business of cutting a piece of thin plywood doesn't appear to be any kind of obstacle to progress. When one spreads 1200 x 2400 of plywood out, occupying almost all of the workshop floor and requiring a good deal of hopping round the edges on tiptoes like a pixie, one starts to wonder where the other end of the saw will go. I had vaguely thought I could cut curves on a bandsaw but now started to wonder how to hold all of that vast area up without it bending and flopping everywhere. So the first planks were cut with a circular saw, the sheet of ply raised up on long bits of two-inch-by-one-inch which is actually 50 x 25 mm because they've gone metric and actuallyer 40.2 x 19.1mm because I just measured it. Where they dredge these measurements up from I don't know. The strips of wood, new-sawn along an unused bookshelf-plank as a straight-edge, which I checked for straightness with a piece of taut string, were not straight, and on further taut string investigation, neither was the sheet of plywood. It had a concave edge. 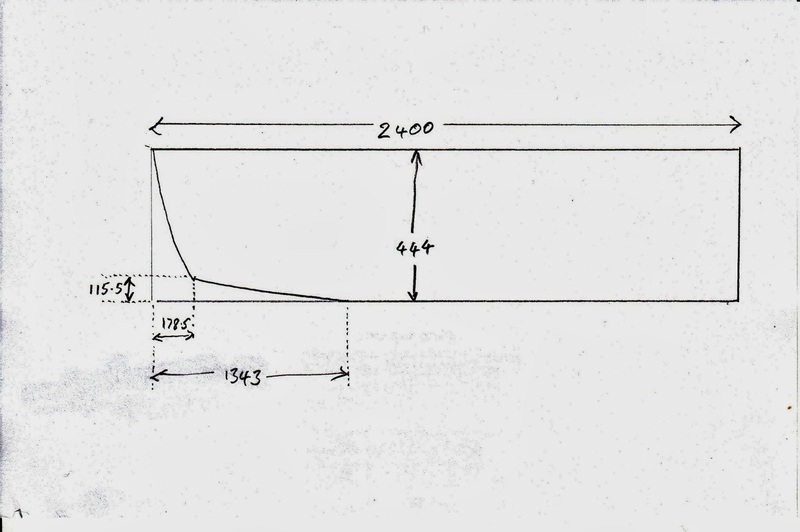 How would you set up a plywood-making machine to produce hour-glass shaped sheets? Must have been phenomenally hard to get that right. Bizarre. Anyway further research (Googling) revealed that after everything's sewn together you set about loosening some stitches and wriggling things round to straighten the boat before glueing it together. My neighbour Graeme's confidence about inaccuracy not mattering is not misplaced. I did cut the curves of the plank ends on the bandsaw, and it was traumatic with eight feet of thin material wafting up and down in the air behind me, and being warned in a dream that I would not manage to cut accurately to the line I allowed 3mm of waste. Then I wondered how to remove the waste. A disc sander was purloined and being warned in another dream that its table was pathetically small I built a wooden stool which, with the additional height of the sander table, allowed the planks of wood to be slid off my huge workbench and run past the sanding disc, and d'you know, this actually worked. Well it nearly did. The workbench isn't flat, and the friction of 48" x 8" of thin ply was more than I imagined. It was a bit jerky to move, until I hit on the idea of pouring quarter-inch ballbearings all over the workbench. Then with the plank sitting on the steel balls, it was dead easy to manipulate, and I was able to sand off the waste right to the very edge of the pencil-line. 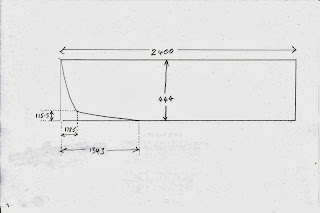 The varying angle of the curve was dealt with by occasionally moving the wooden stool. I felt very proud of my ingenuity. When one plank was done I used it as a template for the other three, and it took a whole day to make the four planks. Blimey. I can see why Mr. Dierking says you'll spend 160 hours on the thing. With all four planks made I clamped them together and discovered they weren't identical and I didn't feel proud of my ingenuity any longer. So I got out a spokeshave and made slightly better job of it by hand. And a jack plane, and planed the edges by hand as well. And started to wonder whether the Amish have it right - that modern machinery is not quite the miracle we've all been brainwashed into thinking it is. Nevertheless I set up the bench drill on the wooden stool and drilled 2mm holes all along the edges of the planks for the sewing process. The holes were marked along the pre-existing pencil marks from which the offsets had been taken, and by dint of holding a pencil and using one finger as the guide and doing it quickly, I ran a pencil line 7mm in from the edge of the plank so that - um - the thickness of the sewn bit would be 7mm in both directions. Don't s'pose it'll make much difference. Each hole was drilled through all four planks at once, the planks being clamped together. Kept having to use extra clamps too, and unclamp the ones that were getting in the way of the drill table. It took ages. A couple of hours. However my wife was in the kitchen and I didn't want to be found jobs to do. 'Kay, those were the easy planks. The side planks are of 4mm ply, flimsier and at 17.5 inches, wider. Clamped all four together to use the disc sander, didn't worry so much about getting them exactly to the pencil line, and planed them by hand afterwards. 4mm ply really is thin, so lots of clamping and unclamping had to take place along the edge being planed to make a decent job of it. And when finished I discovered that two of them were 3mm narrower at one end, so my boat is going to be just a tiny bit higher at one end than the other. Tough. Now I have to work out how to sew them all together, and how to hold the bottom bits at the correct angle to one another while doing so.